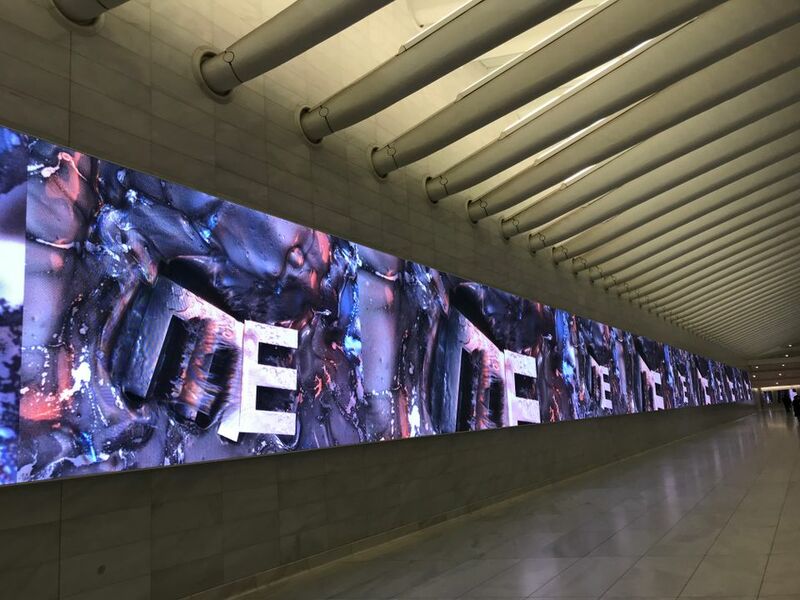 A new video art programme at the Oculus at Westfield World Trade Center, a partnership with Art Production Fund, launched this week with a literal splash: a slow-motion video by the New York-based artist Marilyn Minter, spread across 19 digital advertising screens, in which two “M’s” turn into “me” as they drop in slow motion into a liquid resembling mercury (really silver food colouring in vodka). “I thought this was a perfect time for narcissism, because of our toxic narcissist president,” Minter says of choosing the 2011 work, I’m Not Much But I’m All I Think I Am (until 8 February)—which is “about making fun of the self-involvement of artists”—for the presentation. The 20-second video pops up between the onslaught of digital ads every eight minutes, which Minter hopes will be “this little moment of ‘what’s that?’” to pleasantly disrupt your day. See the Studio Museum in Harlem in its current home, before the building permanently closes next week to make way for a new David Adjaye-designed space, in a three-day event, Last Look (12-15 January), with exhibition tours, performances, talks and workshops. Last Look also celebrates Martin Luther King, Jr Day on Monday, 15 January, since it is typically closed on Mondays. The programme on the holiday includes a day-long performance of The Jumpsuit Project by Sherrill Roland, who is included in the museum’s survey show on emerging artists, Fiction. The formerly incarcerated artist dresses in the bright orange jumpsuit worn by prisoners and speaks one-on-one with visitors in a visitation booth about mass incarceration. The museum is continuing its neighbourhood-wide exhibition and events programme, inHarlem, during its building campaign planned for 2018-21. If you did not get to see David Hockney, the British artist’s blockbuster travelling retrospective, at either Tate Modern in London or the Centre Pompidou in Paris, make sure you check it out before it ends its run at the Metropolitan Museum of Art in New York (until 24 February). The exhibition makes it clear how much the 80-year-old painter brings a sense of joy and experimentation to the medium, not just in his cool, Californian pool scenes from the 60s and 70s, but through his deeply personal portraits (his love for his mum is especially apparent) and vibrant landscapes, including a recent series made using an iPad app. It also, coincidentally, could be the most cost-effective leg of the tour for visitors. While all comers to the Met can still pay whatever they wish, those in London and Paris required paid tickets (£17.50 and €14) to see the show.